I have been trying to reconcile two trends I’m seeing. First, large companies are acquiring venture-backed startups to accelerate their innovation efforts. Even as the R&D budgets and associated efforts of large corporations are increasing, they have not been keeping up with the accelerating pace of technology and business model innovation. These acquisitions fall in two categories. First, acquisitions as a means of jump-starting corporate innovation efforts and getting corporations into the “innovation flow.” Good examples of such venture-backed company acquisitions include Avis’ acquisition of Zipcar, Walmart’s acquisition of Kosmix and of Small Society, Wellpoint’s acquisition of Resolution Health, and Home Depot’s recent acquisition of Black Locus. These acquisitions are less about the technology being acquired and more about the innovations the startup employees will be able to create once they are part of the acquiring company. Second, acquisitions as a means of staying in the forefront of innovation. Companies in this category are acquire frequently in order to enter a new sector or grow a sector they are already working on. Good examples include VMWare’s acquisition of Nicira, and Facebook’s acquisition of Instagram. Finally, a growing number of corporations from American Express to P&G, from BMW to GE, and Walmart to Best Buy establishing operations in innovation centers, such as the Silicon Valley, in order to tap into the startup and innovation flow. Many of the seed-stage startups that number in the thousands and are funded primarily by non-institutional investors, i.e., entrepreneurs themselves, angels, super-angels, friends and families, are not innovating, don’t have no product roadmap, hypotheses of viable business models, or even ideas of how to acquire and retain customers. The number of management teams that can be backed by institutional VCs for scale, give the “escape velocity” and make it a viable candidate for an exit that provides high returns to a venture investor has remained small. As shown below, the number of companies that receive additional rounds of funding by institutional investors has remained largely unchanged in the past 2-3 years. The number of institutional VCs who can fund and materially help these early stage companies is getting smaller. Fewer of these institutional venture firms are able to raise new pools of capital particularly capital that can be used for earlier stage investments. The Limited Partners (LPs) that provide the capital to the venture firms want to take on less risk with the capital they provide and they want returns faster. The thinking is that investing in later stage companies shortens the time to liquidity while reducing the risk of the investment. Because of the overall venture industry’s returns have been low over the past 10-12 years, the allocations LPs are making to venture funds have decreased and are now about 25% of their peak in 2000. LPs want to invest in only a few venture funds that they consider as having the right deal flow of early stage companies that have higher probability for meaningful exits. So we are moving from an industry with a broad investor base to an industry of specialists (SaaS specialists, biotech specialists, consumer internet specialists, etc.). Therefore, because the number of the desirable startup acquisition candidates will remain small, large corporations will need to find ways to foster innovation from within. Corporations must also become better at selecting which companies to acquire. In this way will be able to identify companies that can provide the desired innovation in the short term but also have the teams that will stay with the acquiring company thus providing long-term benefits. 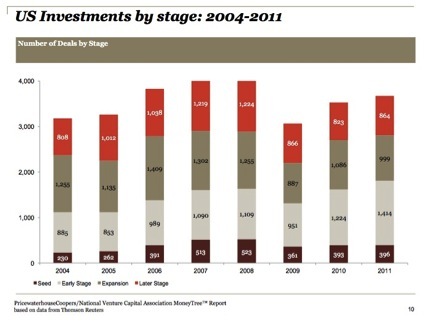 The capacity of institutional VCs to invest in seed-stage startups will not increase. In fact, it may continue to decrease further. Rather than creating as many seed-stage startups with weak teams, dubious innovations and no long-term prospects, entrepreneurs must seek to form strong teams that can innovate and build large and enduring companies.